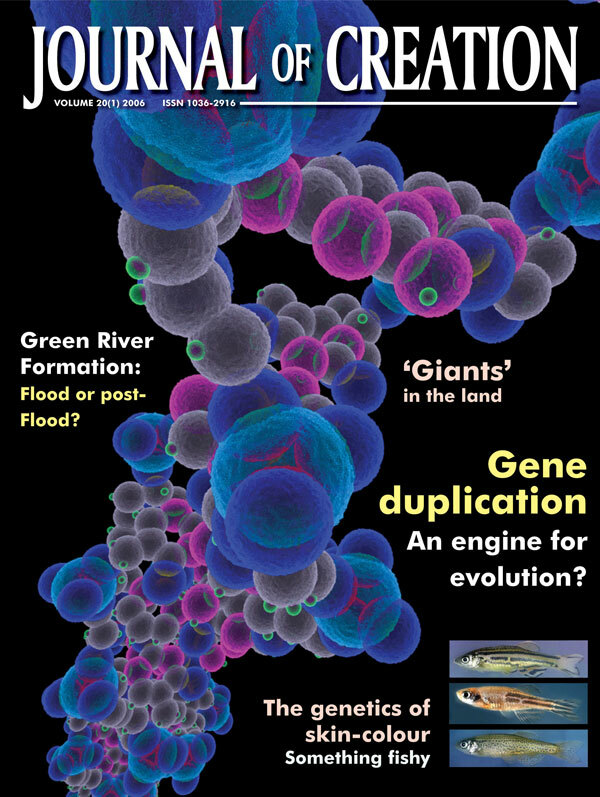 The Green River Formation (GRF) is a controversial formation within creationist earth science. Evolutionary geologists see the GRF as a sequence of about six million varves deposited with other associated formations over a few tens of millions of years of geological time.1 Furthermore, these geologists also ‘find’ Milankovitch and sunspot cycles in the ‘varves’. A number of creation geologists have found evidence that has convinced them the GRF formed in a post-Flood lake. The several times I have examined the GRF from a geomorphological point of view, I have come to the conclusion that it was formed during the Flood. It is within this context of global tectonics with uplifting mountains and sinking valleys or basins that the Green River Formation (GRF) fits. 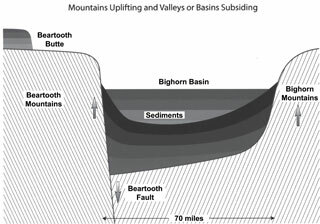 The formation was deposited within several sinking basins while mountains uplifted in the central Rocky Mountains. Such a tectonic scenario fits well with Flood tectonics, especially during the Recessional Stage,5 throughout the whole Rocky Mountain area from New Mexico north to Montana (figure 9). During and after this great vertical tectonic movement, the basins that contain the GRF, like other Rocky Mountain basins, collected huge volumes of thick sediments that later turned into sedimentary rock. 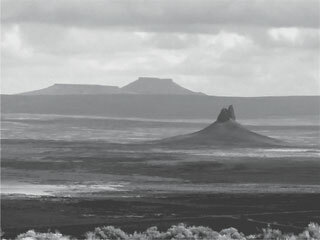 When we discuss the GRF, we must include the coarser-grained Wasatch Formation and the mostly volcanic Bridger and Washakie Formations, since these formations interfinger with the GRF as part of the ‘basin fill’. The Greater Green River Basin covers an area of 51,000 km2 with a maximum basin fill thickness over 3,000 m.6 The Uinta-Piceance Creek basins cover almost the same area, but with a maximum depth of 6,800 m adjacent to the southern Uinta Mountains.7 The average depth in the Uinta-Piceance Creek Basins is probably around 3,000 m with a volume of around 130,000 km3. There must have been even more basin fill sedimentary rocks, since a significant amount of erosion has occurred. How is this immense volume and great depth of sediment to be deposited in these basins within the short post-Flood timescale? One can estimate that mountain erosion and basin sedimentation would have been greater for several hundred years following the Flood due to the post-Flood Ice Age,8 but this extra sedimentation would be a drop in the bucket compared to the huge volume in these basins. It seems that only the global catastrophe of the Flood could account for so much sediment, similar to other monstrous sedimentary deposits in the rock record. Most of the sediments seem to have been deposited as horizontal layers with little erosion between. If sedimentation were post-Flood from the surrounding mountains, one would expect immense, thick alluvial fans and landslides tapering basinward away from the mountains. Many of these mass movements should also reach the centre of the basins, since it is well-known that mass movements can travel great distances on a low slope.9 This debris would likely be a chaotic mixture of breccia and debris flow material, rounded rocks from fluvial action, numerous cut and fill structures and numerous channels. This does not seem to be the style of basin sedimentation, and there is little indication of significant mass flow in the centres of the basins. During the mid-summer 2004 field trip with John Whitmore, I estimated that about 600 m of sedimentary rocks were eroded from the central part of the eastern Greater Green River Basin. I arrived at this based on a series of gently southward dipping strata on the southern part of the basin with approximately 100-m high cuestas11 facing north. If you project the strata northward, the strata once were about 600 m higher over a large area at the centre of the basins. This was reinforced by a series of erosional remnants on the north side of the basin that were also approximately 600 m higher than the eroded valleys between. Figure 10 shows some of these sedimentary remnants in the distance with the Boar’s Tusk—a small remnant of the throat of a volcano that is over 100 m high—in the foreground. The other basins also show at least 600 m of erosion. 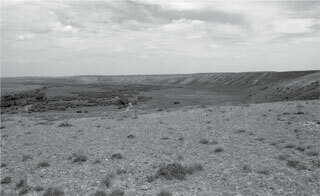 In Fossil Basin, the east-west valley excavated through the central part where the Fossil Butte National Monument is located (figure 2), gives evidence of about 600 m of erosion (figure 4). From a uniformitarian point of view, slow erosion of sedimentary rocks over millions of years does not make sense, because these erosional remnants should have also been eroded away or reduced greatly in size, especially since precipitation and mass wasting is greater the higher the elevation and the steeper the slopes. Furthermore, sedimentation from higher areas should tend to fill up the valleys with fairly recent alluvium. The current amount of alluvium in low areas appears to be quite thin. The geomorphology of the area implies rapid erosion over a short period of time. Tropical and subtropical elements, often in mixtures with cool temperate fossils, are more a signature of Flood deposition. Such warm-climate vegetation can generally be found at middle and high latitudes of both the southern and northern hemispheres.15 It is dated as ‘Cretaceous’ and ‘Cenozoic’ by evolutionists. This warm-climate material was likely spread around the earth in strong Flood currents.16 It does not make much sense that such warm climate plants and animals lived at high latitude and within continental interiors during the post-Flood period. Furthermore, this evidence also implies that the Flood/post-Flood boundary is in the late Cainozoic in many areas of the world. The GRF is famous for the immense number of generally excellently preserved fossils, especially fossil fish (figure 3). The fish fossils are found in abundance in the Green River supposed varves. Such an observation indicates that these thin laminae are not varves since fish will rot in only a few weeks, even on the oxygen-less bottom of a deep, cold lake.17 Such well-preserved specimens indicate rapid burial, not the slow burial one would expect in a lake. Pediments are not observed being formed today. In fact, they are being destroyed by erosion. Uniformitarian scientists cannot explain the formation of pediments. The fact that pediments have formed on top of the basin-fill sediments strongly indicates that these basin fills, including the GRF, were deposited in the Flood. The pediments observed by the author near Grand Junction were capped by cobbles and boulders, some of which were exotic quartzites that outcrop over 100 km east up the Colorado River. Such exotic rocks indicate the formation of pediments by strong downvalley flowing currents (uniformitarian scientists believe pediments were formed by streams flowing out of the adjacent mountains). I have been studying the long-distance transport of exotic, well-rounded quartzite cobbles and boulders with percussion marks in the south-west20 and north-west part of the United States and adjacent Canada.21 These quartzites overwhelmingly indicate Flood transport during the Recessive Stage. That is one reason why I am so interested in studying, in more depth, the basins containing the GRF, which are between my two study areas. I was rather surprised and delighted to find that many quartzite cobbles and boulders had been spread out over the basin fills (figure 11). The exotic, well-rounded quartzite has a similar signature to quartzite I have found elsewhere and indicates transport by the Flood, mostly from the mountains of south-east Idaho and the Uinta Mountains. I have not figured out the exact significance of all this quartzite, yet. However, one conclusion is that the basins fills must be from the Flood, since the quartzites are commonly on top of the GRF and its associated formations. As already stated, the basins containing the GRF were likely formed at the same time as other Rocky Mountains basins. Some of these basins have thick, low ash, low clay coal seams of early Cainozoic age within the uniformitarian timescale.22 For instance, in the Powder River Basin of north-east Wyoming and south-east Montana (figure 9), there are several of these coal seems. The newly discovered Big George Seam in the western Powder River Basins covers an area of about 100 km north-south by 40 km east-west, and is 61 m thick. It is difficult enough to explain such coal seams during the Flood. However, it seems to be several orders of magnitude more difficult to explain such basin fill coal seams from a uniformitarian or a post-Flood view. 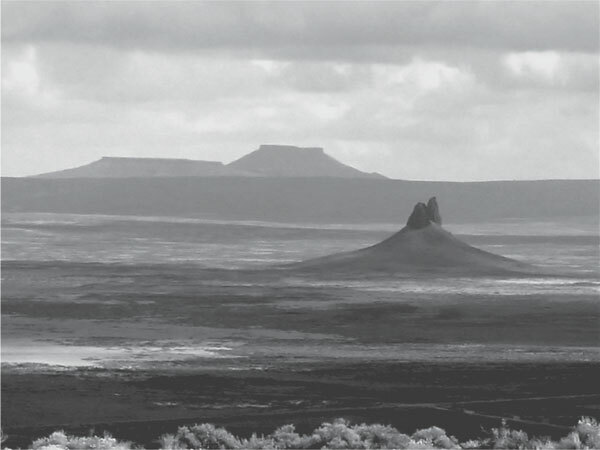 The Bridger and Washakie Formations are composed mainly of volcanic sediments, possibly from the Absaroka volcanic field of north-west Wyoming.23 Such volcanism would produce a volcanic winter, similar to a nuclear winter.24 Temperatures would be quite cold in the central Rockies as a result. How can the warm temperate to tropical fossils in the Bridger Formation25 be explained in a cold winter? How can the Absaroka volcanics and the Columbia River basalts be from the Flood while the Green River and associated formations be from the post-Flood period? 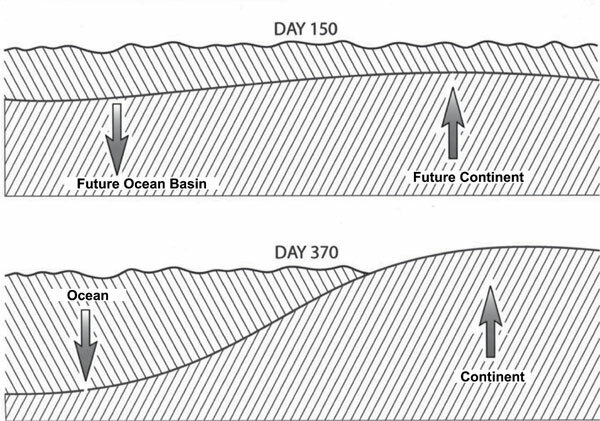 Many other arguments have been adduced that the Flood/post-Flood boundary is generally in the late Cainozoic for the western United States and for much of the world.3,4,30–32 This evidence includes characteristics of the Ice Age, meteorite impacts, planation surfaces, water and wind gaps, submarine canyons, rapid continental erosion, sinking ocean basins, inselbergs and other erosional remnants, and the formation of the continental shelf and slope. Moreover, these features are worldwide indicating a global Flood and not some local event. There are a number of features in the GRF and associated formations that could suggest a post-Flood lake environment. Many of these are indeed challenging to explain within a Flood model. However, based on the abundant evidence that the GRF and its associated formations are from the Flood, I believe we need to think of Flood mechanisms for these features. I am sure that Flood mechanisms can be developed in the future and that these will provide insight into the many complexities of the global Flood—an event I believe we are only beginning to understand. Bradley, W.H., The varves and climate of the Green River Epoch, U.S. Geological Survey Professional Paper 158, Washington, D.C., 1929. Return to text. King, L.C., Wandering Continents and Spreading Sea Floors on an Expanding Earth, John Wiley and Sons, New York, pp. 17, 71, 1983. Return to text. Oard, M.J., Vertical tectonics and the drainage of Floodwater: a model for the Middle and Late Diluvian period—Part I, CRSQ 38(1):3–17, 2001. Return to text. Walker, T., A biblical geological model; in: Walsh, R.E. (Ed. ), Proceedings of the 3rd International Conference on Creationism, Creation Science Fellowship, Pittsburgh, pp. 581–592, 1994. Return to text. Roehler, H.W., Introduction to Greater Green River Basin geology, physiography, and history of investigations, U.S. Geological Survey Professional Paper 1506-A, U.S. Government Printing Office, Washington, D.C., p. A1, 1992. Return to text. 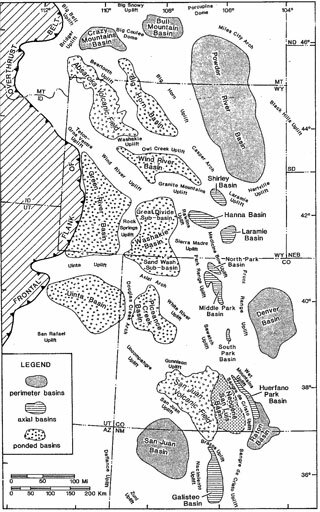 Johnson, R.C., Early Cenozoic history of the Uinta and Piceance Creek Basins, Utah and Colorado, with special reference to the development of Eocene lake Uinta; in: Flores, R.M. and Kaplan, S.S., (Eds. 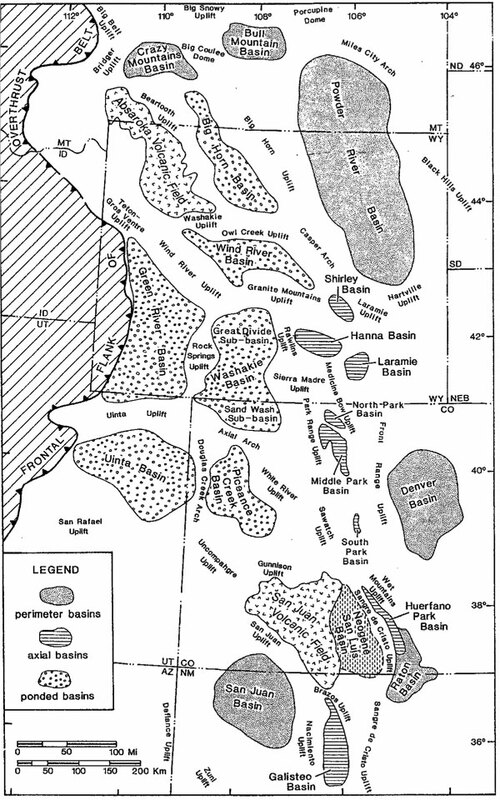 ), Cenozoic Paleogeography of West-Central United States, Rocky Mountain Section of the S.E.P.M., Denver, p. 254, 1985. Return to text. Oard, M.J., An Ice Age Caused by the Genesis Flood, Institute for Creation Research, El Cajon, CA, 1990. Return to text. 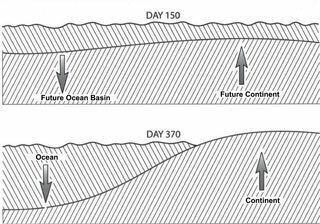 Oard, M.J., Ancient Ice Ages or Gigantic Submarine Landslides? Creation Research Society Monograph No. 6, Chino Valley, AZ , pp. 33–39, 1997. Return to text. A cuesta is a low, asymetrical ridge, with a gentle slope on one side, conforming with the dip of the underlying strata, and a steep face on the other. Return to text. Oard, M., Frozen in Time—The Woolly Mammoth, the Ice Age and the Bible, Master Books, Green Forest, AR, 2004. Return to text. Oard, ref. 10, pp. 258–260. Return to text. Oard, M.J., Mid and high latitude flora deposited in the Genesis Flood—Part I: Uniformitarian paradox, CRSQ 32:107–115, 1995. Return to text. Oard, M.J., Mid and high latitude flora deposited in the Genesis Flood—Part II: A creationist hypothesis, CRSQ 32:138–141, 1995. Return to text. Whitmore, J.H., Experimental fish taphonomy with a comparison to fossil fishes, Loma Linda University Dissertation, Loma Linda, CA, 2003. Return to text. Roehler, ref. 6, p. A4. Return to text. Oard, M.J. and Klevberg, P., Deposits remaining from the Genesis Flood: Rim Gravels in Arizona. CRSQ 42(1), 2005, (in press). Return to text. Oard, ref. 10, pp. 266–267. Return to text. Brand, L.R., Goodwin, H.T., Ambrose, P.D. and Buchheim, H.P., Taphonomy of turtles in the Middle Eocene Bridger Formation, SW Wyoming, Palaeogeography, Palaeoclimatology, Palaeoecology 162:172, 2000. Return to text. Holt, R.D., Evidence for a Late Cainozoic Flood/post-Flood boundary. Journal of Creation 10(1):128–167, 1996. Return to text. Brand et al., ref. 23, pp. 171–189. Return to text. Oard, ref. 10, pp. 267–273. Return to text. Coffin, H., personal communication. Return to text. A lahar is a destructive landslide or mudflow of hot volcaniclastic material sliding down the flanks of a volcano under its own weight. Return to text. Coffin, H.G., Special edition: The Yellowstone Petrified ‘Forests’, Origins 24(1):39, 1997. Return to text. Holt, ref. 24, pp. 128–167. Return to text. Oard, ref. 10, pp. 258–278. Return to text. Spencer, W.R. and Oard, M.J., The Chesapeake Bay impact and Noah’s Flood, CRSQ 41(3):206–215, 2004. Return to text. Whitcomb Jr, J.C. and Morris, H.M., The Genesis Flood , Baker Book House, Grand Rapids, MI, pp. 427–428, 1961. Return to text. Coffin, H.G. with Brown, R.H., Origin by Design, Review and Herald Publishing Association, Washington, DC, p. 67, 1983. Return to text. Dickinson, W.R. et al., Paleogeographic and paleotectonic setting of Laramide sedimentary basins in the central Rocky Mountain region, Geological Society of America Bulletin 100:1025, 1988. Return to text.